If you’re a OnePlus 6 user, you’ve most probably received the Oxygen OS 9.0 update based on Android Pie. We’ve already shown you how to install it, in case you haven’t. The update brings several Android Pie features while also leaving out a few such as the new overview screen, app slices, etc. But this is Oxygen OS and not stock Android, it is OnePlus’ version of Android Pie. So it is what it is. As new Android updates often do, the new update has also introduced a new problem for those who like to root their devices. If you want to install TWRP recovery and root OnePlus 6 on Oxygen OS 9.0, you can follow the guide below. The problem with the new update is that the current versions of the TWRP recovery available for the OnePlus 6 aren’t compatible with Android Pie. This results in users not being able to flash the Magisk zip, therefore, unable to root their devices. The situation is pretty similar if you’re running one of the Oxygen OS Open Betas based on Android Pie. Although, I’ve been able to root all the three Open Beta ROMs using TWRP without any problems before. The traditional way of rooting an Android device these days is to install TWRP recovery on it and then flash Magisk. If you remember though, when we showed you how to root the OnePlus 6 on Android Oreo, we did not use TWRP. There was no TWRP available at the time of that writing. The way it was done was using a patched boot image that could be flashed using fastboot. This way, you could bypass the need for TWRP, at least when it comes to flashing the Magisk zip to root your device. We can adopt a similar approach in this case as well. XDA Senior Member ManikandanGuru, has created patched Magisk boot images for Oxygen OS 9.0 and all the three Oxygen OS Open Beta ROMs. All you’ll have to do is download the correct boot image as per your Oxygen OS version and flash it via fastboot. 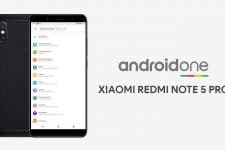 A OnePlus 6 with an unlocked bootloader running on Android Pie [Oxygen OS 9.0 | Open Beta 1, 2, 3 | Developer Preview 3]. A PC with ADB and Fastboot drivers installed. We have dedicated guides for installing it on all three major desktop operating systems. Download the appropriate patched boot image from the links provided above. Transfer this downloaded image to the ADB installation folder. This is usually the platform-tools folder in C: drive (C:\Android) or the Minimal ADB and Fastboot folder in the Program Files (x86) folder (C:\Program Files (x86)\Android) unless you changed it during installation. Reboot your phone in fastboot mode. Press and hold the Volume Up and Power button together on your OnePlus 6 until it boots into fastboot mode. Connect your phone to the computer and run the ADB command interface. To do this, go to the ADB installation folder on your PC. (C:\Program Files (x86)\Android). Then, type in cmd in the address bar and hit enter to open a command prompt window in the folder. Mac users will have to similarly open the Terminal in the ADB folder while Linux users can simply launch the Terminal. Boot your device using the patched boot image via the following command. Here, oos_9.0_patched_boot.img is the name of the downloaded boot image file. Your device will boot normally now and when it does, download the Magisk Manager APK from this link and install it. When you launch the Magisk Manager app now, it’ll show that you’re rooted, but this will change once you reboot the device. 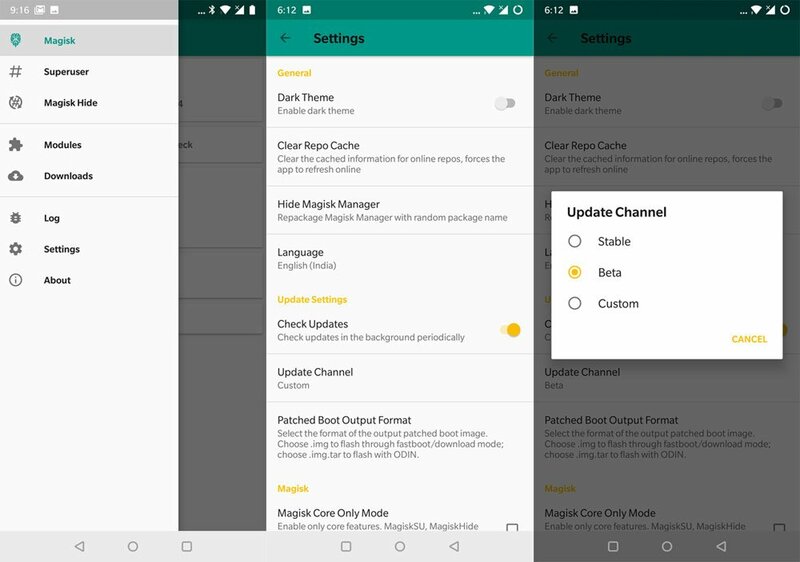 To permanently root it, go to Magisk Manager Settings and tap on Update channel then change it to Beta. Now tap the Install button and select Direct Install (Recommended) and wait for the boot.img to be patched. Reboot your device when prompted. If you do need TWRP recovery on your device and don’t want to wait for an official working build, you can use a modified TWRP that already works with Android Pie on the OnePlus 6. This recovery, called ‘blu spark’ TWRP recovery, has been made by eng.stk who has also created the ‘blu spark’ kernel for the OnePlus 6. We’ve already shown you how to install TWRP recovery before. All you have to do is use the two files linked above instead of the official TWRP files linked in the original guide. Once you have the TWRP recovery installed, download the latest Magisk zip file. Reboot your device in recovery mode. To reboot in recovery mode, power off your device first. Now press and hold the Power and Volume down buttons simultaneously until your phone vibrates. Let go of the buttons once it does and wait for it to boot into TWRP recovery. When it does, select Install, then select the Magisk zip and swipe at the bottom to flash it. Done! You have successfully rooted your OnePlus 6 on Android Pie-based Oxygen OS 9.0, Open Beta 1, 2, 3 and Developer Preview 3.